We’d love your help. Let us know what’s wrong with this preview of Tales of the Slayer, Vol. 4 by Michael Reaves. I can't be helpless like that...."
At eighteen, each Slayer must face a terrifying trial: the Tento di Cruciamentum. This time-honored, albeit cruel, rite of passage forces each Watcher to drain the Slayer of all her physical powers and then send her to vanquish a powerful vampire using only her wits. When Buffy Summers underwent her Cruciamentum, she managed to defeat Kralik, a vampire who had been committed to a sanitarium as a human for torturing and murdering more than a dozen young women before he was turned. However, not all Slayers have been so cunning. To ask other readers questions about Tales of the Slayer, Vol. 4, please sign up. 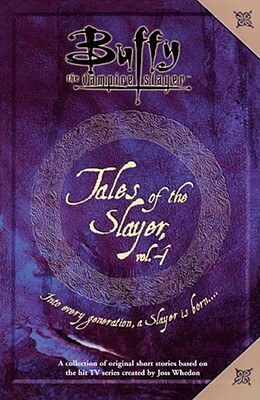 This volume contains 8 "shorts" about previous slayers. I have never read any of the other volumes but I figured that wouldn't have much impact on my understanding of the story since I figured out that each volume has different stories, each penned by a different writer. Not like it is a linear tale of each slayer that came before Buffy in chronological order. "It's All About The Mission" by Nancy Holder. I like Holder's writing and since she has written so many Buffy/Angel tales, I trusted this s This volume contains 8 "shorts" about previous slayers. I have never read any of the other volumes but I figured that wouldn't have much impact on my understanding of the story since I figured out that each volume has different stories, each penned by a different writer. Not like it is a linear tale of each slayer that came before Buffy in chronological order. I like Holder's writing and since she has written so many Buffy/Angel tales, I trusted this story to be worth my time. I was surprised to see the story was about Nikki Wood, but it was nice to see a familiar name to ease into some non-Buffy stories. Fans of the show know how she meets her end but it was kinda cool to to get know a little more about her and to see her watcher. This short started off slow for me but I liked how the Watcher/Slayer relationship didn't exactly mirror that of Giles and Buffy. Plus, it was refreshing how the story played out as it was the only story in the book that changed direction and ended on a different note than all of the others. This contribution to the volume bored me. I liked the idea behind it all but it wasn't handled very well in my opinion. Granted, the dynamic between the Slayer and her Watcher was quite different in this entry but overall, the story lacked something that grabbed my attention. The ending was rather abrupt to me. "Sideshow Slayer" by Greg Cox. The setting of this story was interesting to me. The Slayer calls a carnival home and the cat and mouse game of the Cruciamentum takes place in a fun house. Definitely a different set up, which was nice. This story was not a bad one but it wasn't great either. An unstable Watcher was a nice touch but overall the story wasn't as good as it could have been. Finally, a female Watcher to shake things up a bit. Granted, I was slow to warm up to this entry but after realizing that Beryl wasn't even an actual Slayer in the start, just a potential was a nice twist on a plot point that was growing old at this point in the book. For the most part, I liked this story and the different plotting that Levy brought to the book. Another abrupt ending but I understand that eqah story has to end at some point. This tale really shook things up. A completely different country and time period made for a interesting shake-up. I liked how her Cruciamentum was set up differently than previous ones, more intense with more than just one angry vamp to defeat. It started to run a little long for me, but I enjoyed it for the most part. The last collection of short stories was surprisingly the best overall by quite a bit. Although all of the stories shared a similar event (the Cruciamentum, the test a slayer takes at 18 when they are lacking their tricked by their watcher and lacking all powers), the more common thread was stronger characterization and more interesting plots. Here's how I'd rank them from worst to best. Sideshow Slayer - A fun story set in a traveling carnival where demons and the supernatural fit in. A few shoc The last collection of short stories was surprisingly the best overall by quite a bit. Although all of the stories shared a similar event (the Cruciamentum, the test a slayer takes at 18 when they are lacking their tricked by their watcher and lacking all powers), the more common thread was stronger characterization and more interesting plots. Here's how I'd rank them from worst to best. Sideshow Slayer - A fun story set in a traveling carnival where demons and the supernatural fit in. A few shockingly violent moments also made it memorable. Alone - This 1800's story about a slayer returning home took a shocking turn into an abusive parent story that I did not see coming. Two teenage girls at the mall - A somewhat predictable twist where the story is written from the vampire's perspective; the conversation between the two parties at the end reinforces why Jane Espensen is the best writer I've seen in these books so far. Undeadsville - I always wondered why they didn't do a storyline on the tv show about a slayer that was turned into a vampire. This story gets extra points for that reason, and also some nice use of multiple viewpoints. It's All about The Mission - one of the more straightforward stories in the set, this one is great for fans of the show by capitalizing on the Principal Wood storyline from the last seasons. Back to the Garden - A great story set in the 1960's about a pacifist slayer and the commune as a sanctuary for the supernatural. Survivors - The watcher in this story (as a traumatized WW1 survivor) and his slayer (as a girl covering the duties of both people) were two of the most compelling characters in any short story so far. This exciting volume about the fictional Slayers deals with the most harrowing test they can face—the Cruciamentum. This grueling test is meant to weaken the Slayer and pit her against a formidable enemy. Whether this seems cruel and inhumane or simply necessary is meant for the reader to judge as we see both Slayers and their Watchers put through the wringers. The stories are riveting, briskly paced and action packed, just what you would expect from tales about girls fighting the forces of dark This exciting volume about the fictional Slayers deals with the most harrowing test they can face—the Cruciamentum. This grueling test is meant to weaken the Slayer and pit her against a formidable enemy. Whether this seems cruel and inhumane or simply necessary is meant for the reader to judge as we see both Slayers and their Watchers put through the wringers. The stories are riveting, briskly paced and action packed, just what you would expect from tales about girls fighting the forces of darkness. The world isn’t so neatly outlined in black and white here, where demons can prove friends and humans can be enemies. The Slayers are as varied as their battles, the Watchers sometimes ruthless generals and sometimes worried parental figures. It’s a thrilling addition to the series and one that stamps the slaying world with humane and inhumane figures. This is a collection of short stories that tell about different slayers and their partaking of the Cruciamentum. This is a test for slayers who are deprived of their strength and they must face a monster. They must survive on their wits. These stories have different time eras and each story has their own slayer. There is no Buffy story and the only slayer from the show that has a story is Nikki Wood. The time eras range from the Spanish Inquisition to the 1980's. I believe that when reading an an This is a collection of short stories that tell about different slayers and their partaking of the Cruciamentum. This is a test for slayers who are deprived of their strength and they must face a monster. They must survive on their wits. These stories have different time eras and each story has their own slayer. There is no Buffy story and the only slayer from the show that has a story is Nikki Wood. The time eras range from the Spanish Inquisition to the 1980's. I believe that when reading an anthology that readers will enjoy some stories and dislike others. That was the case here. All of the authors had an interesting take on one singular event that happens in vampire slayer's life but in the overall arc is small in nature. There were a couple of times that the stories hinted at the television show and I appreciated that. The one thing I did take from reading this collection is I view Buffy's Cruciamentum differently. I did not like Giles' contribution to this stupid tradition but after reading this I don't regard him with as much disdain as I once did when dealing with this event. Some good stories in this. I liked that every story revolved around a particular ritual that was the focus of just one episode of the Television show. Some of the stories were well written. It was a fun, quick read. I like this Tales collection better then the the third volume because the presence of a unifying theme makes the stories sharper and a bit more focused. I found all the stories enjoyable, and the one by Scott Allie was my favorite. The first story is about Nikki Wood, 1970s-era, Cleopatra Jones-style Slayer. Maybe you remember her from a very intense subway sequence...? I love these books. The stories are like candy; not very heavy or intellectually-nutritional, but so delicious and fun. Nagu jutukogudega ikka, mõned on paremad lood, mõned mitte. Mulle meeldisid kõige rohkem biitnik-slayer ja lugu Dotist ja Reginaldist. There's something about finding a fandom book at a used book store that makes me happier than buying a brand new highly anticipated book. the Nikki Wood story didn't work like the history I know, in this book, she was 18 when she got pregnant but she already had her son before she was called as a slayer. The short stories are all of the girls turning 18 and having their power taken away so they're all helpless and have to defeat some big bad vamp. So fun to read!